There can be up to a maximum of ten dogs in each class. Call Russell on 07717 763044 or email knightsbaydogtraining@hotmail.com to book on the next course. 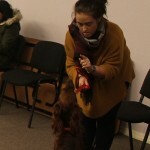 The cost of this six-week course is £55.00 per dog. You can pay via cheque (made payable to “Knightsbay Dog Training”) or via Paypal. Please note that refunds will not be given if you are no longer able to attend your booking. 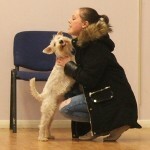 Training your dog can be very rewarding and is a big part of dog ownership. 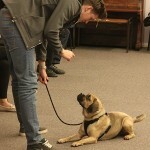 Knightsbay Dog Training encourages dog owners to take an understanding and responsible view of dog training. 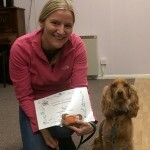 Russell offers a six-week dog obedience course in Leicester which helps dog owners to train their dog using positive reinforcement which are fair, kind and effective methods. 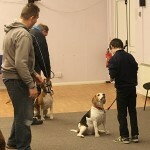 During the six one-hour sessions he covers the basic commands including “Sit”, “Down”, “Come”, “Stay” and “Walk to Heel”. He also deal with behaviour in a range of situations for example being outside and dealing with noises. Here are some dogs and their owners practising the “Stay” and “Come” commands. One-to-One Dog Obedience Training sessions are also available to dog owners in Leicestershire, Northamptonshire, Warwickshire or Derbyshire. All breeds are welcome and we will have our Pet Supplies available too. Light refreshments are also available.